This is Pokémon for Switch & it’s coming this year! 30 maj, 2018 Säg något! 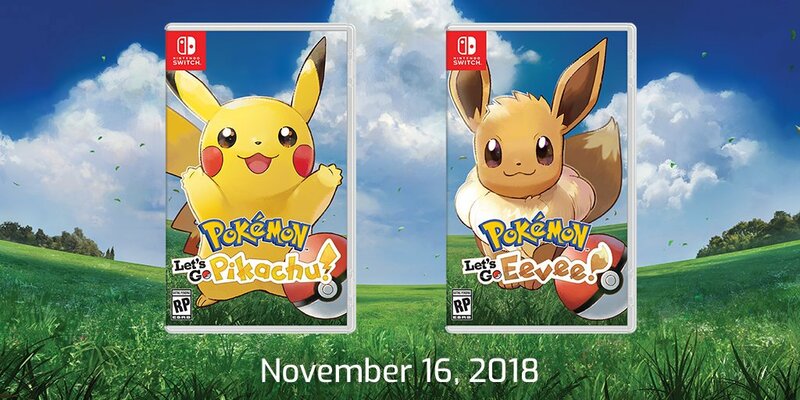 Pokémon Let’s Go: Pikachu and Pokémon Let’s Go: Eevee. The game looks so much better than I thought it would actually, for me who had my Pokémon glory days with Blue, Red and Yellow this title really speaks to me. Since it seems like it’s the original 151 Pokémon, plus the Alola forms and a new never before seen Pokémon. And we’ll be returning to the Kanto region, seems like a perfect fit for me. I’ll miss some of my favorite Pokémon from Gold and Silver. But perhaps they’ll update the game to add more Pokémon in the future? Sure the game is taking a bit of (okay a lot) inspiration from Pokémon Go, but I think it works out pretty good. In the video at least. Perhaps this will be the time I finally try Pokémon Go? We’ll see. If this isn’t to your taste, they are releasing a real mainline Pokémon game next year. It will follow in the same style as X, Y and Sun, Moon. Here are the lovely box arts for the game. Which version are you getting? Before I end this post I’ll leave you with one more thing, the game will be released on November 16th. So it will be a bit of a blast to the past for me again.